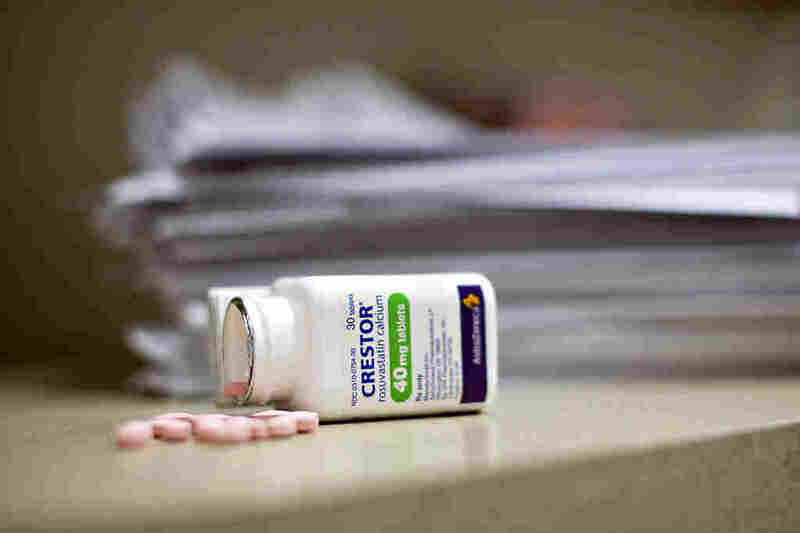 Crestor Prescriptions Rise After Doctors Get Free Meals : Shots - Health News Researchers say the time doctors spend with drug company representatives when they are dropping off meals is probably more important than the food in influencing prescription choices. A single modest meal for a doctor was associated with a higher likelihood he or she would prescribe Crestor, a cholesterol drug, instead of a generic. Evidence is mounting that doctors who receive as little as one meal from a drug company tend to prescribe more expensive, brand-name medications for common ailments than those who don't. The researchers did not determine whether there was a cause-and-effect relationship between payments and prescribing, a far more difficult proposition, but their study adds to a growing pile of research documenting a link between the two. A ProPublica story published in March found that doctors who took payments from the pharmaceutical and medical device industries prescribed a higher proportion of brand-name medications than those who didn't. It also found that the more money a doctor received, the higher the percentage of brand-name drugs he or she prescribed, on average. What makes the latest study different is that it looked at specific drugs. In an editor's note, Dr. Robert Steinbrook wrote that the recent analyses "raise a broader question. Is it necessary to prove a causal relationship between industry payments to physicians and the prescribing of brand-name medications?" Other than for research and development, and related consulting, Steinbrook wrote, "it is already evident that there are few reasons for physicians to have financial associations with industry. Outright gifts, such as meals, may be legal, but why should physicians either expect or accept them?" Holly Campbell, a spokeswoman for the Pharmaceutical Research and Manufacturers of America, an industry trade group, said the latest study creates more confusion than clarity. In part, that's because the researchers acknowledge that they couldn't determine whether the drugs were prescribed before or after doctors received meals paid for by companies. Sift nearly 15 million records in ProPublica's database to see if your doctor has received money from a drug or device company. Search for your physician. "This study cherry-picks physician prescribing data for a subset of medicines to advance a false narrative," Campbell wrote in an email. "Manufacturers routinely engage with physicians to share drug safety and efficacy information, new indications for approved medicines and potential side effects of medicines. As the study says, the exchange of this critical information could impact physicians' prescribing decisions in an effort to improve patient care." In the study released Monday, a team led by Colette DeJong at the University of California, San Francisco examined four classes of medications, including those that treat high cholesterol, heart rhythm disorders, high blood pressure and depression. The researchers identified one heavily marketed brand-name drug in each class — Crestor, Bystolic, Benicar and Pristiq — for which there are cheaper, equally effective options. DeJong and her colleagues then looked at physicians who received meals specifically tied to those drugs (companies have to list the products associated with each of their payments) and their 2013 prescriptions in Medicare's drug program. The researchers excluded physicians who received other types of payments — such as for promotional speaking and consulting — in an effort to isolate any relationship to the meals alone. Though only a relatively small percentage of physicians who prescribed the drugs examined in the study received payments from their makers, those doctors prescribed the drugs more often than other doctors. Physicians who received meals related to Crestor on four or more days prescribed the cholesterol-fighting drug at almost twice the rate of doctors who received no meals. The difference was even more marked for the other drugs. Physicians who received meals prescribed Bystolic, a blood pressure pill, at more than five times the rate of their uncompensated peers; Benicar, for high blood pressure, at a rate 4.5 times higher; and Pristiq at a rate 3.4 times higher. Higher rates of prescribing were also observed when doctors received just a single meal, even after taking into account a physician's specialty and region of practice. Dr. R. Adams Dudley, a professor of medicine and health policy at UCSF and one of the study's authors, said he and his colleagues expected to see "some evidence that doctors were responsive to incentives, what with their being humans and all." Still, he said, "I think we were probably surprised that it took so little of a signal and such a low-value meal. ... It has changed our thinking." DeJong said the researchers don't think the meals themselves cause doctors to prescribe more of a drug, but rather the time they spend interacting with drug reps when they drop off those meals. "There's really no way that a $10 bagel sandwich can influence a doctor in a gift way," she said. "We think it represents more reciprocity, the time spent with the drug rep and the fact that the doctor is listening to this 10-minute pitch." Dudley suggested that patients talk to their doctors and ask, "Is there a generic that's just as good?" "Hopefully they can get the doctor off of the prescribing behaviors that we're observing," he said. ProPublica's deputy data editor, Olga Pierce, contributed to this report. Does your doctor accept payments from pharmaceutical and medical device companies? Find out using Dollars for Docs.